On one of the first warm days this past spring I worked up the courage to ask a senior graduate student in my lab if she was keen for an afternoon Starbucks trip. The coffee invitation was a ruse, I really wanted to ask her for advice on feeling productive in as a graduate student. We got a couple of meters away from the building and instead of actual words coming out of my mouth I just started bawling. The super unattractive type of crying with loud high pitched gasps for air between sobs. It was not the first time this year that I had found myself uncontrollably crying in front of a lab mate. Twice over the winter, following really frustrating meetings with my advisor, I had gone to the office of a post doc in our lab unable to stop tears from streaming down my face. This past year has been hard, much harder than I expected. I have wanted to write a reflection on my first year of grad school for months, but could never get it quite right. Now that I can see the undergrads return, I cannot delay anymore. Even though it may not be perfect, I am going to post this before I become swept up in new semester, or chicken out because I do not normally share this much. I had very unrealistic expectations for myself as a graduate student. In the back of my mind I thought that I would wake up one morning and just instantly be the iconic old-school scientist that exists in our collective cultural imagination. The one with messy hair locked away in the ivory tower, constantly reading and experimenting. I thought my proclivity to stay in bed and watch Netflix would magically disappear, replaced with a love of reading textbooks and teaching myself coding. Needless to say, starting a PhD did not turn me into a paragon of intelligence, efficiency and productivity. I woke up every morning still me, bad habits and all. I found the independence of my program was overwhelming. I like deadlines and requirements and clear expectations. I was not prepared for how hard it would be to adjust from the organized rubrics of undergrad or constant experiments as a technician to the weird, amorphous position of graduate student. The minimal coursework and directive to ‘read and think’ left me feeling adrift. 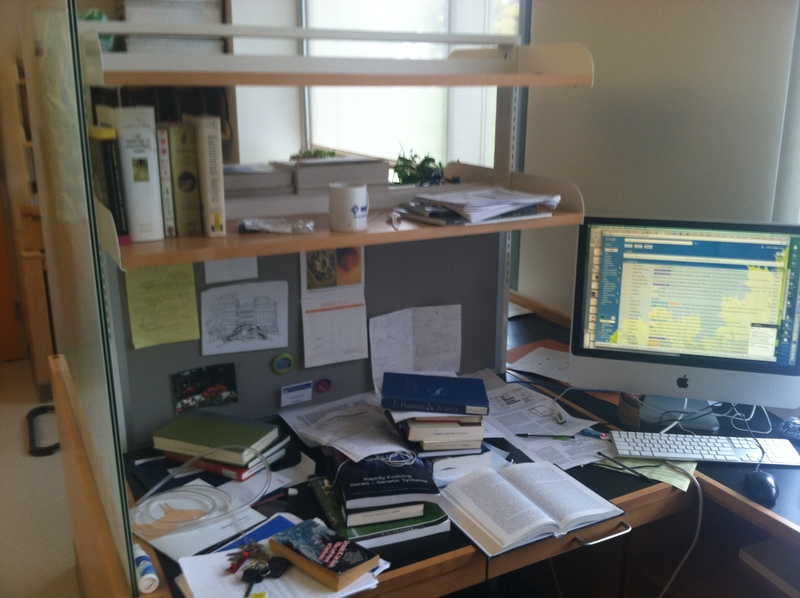 Without structure from courses, seminars, or journal clubs I felt isolated. I balked at reading historical and/or challenging articles when I had no one to discuss them with. I was unsure about where to start with the literature and spent more time than I care to admit amassing a folder of journal articles that I barely read. I struggled to feel motivated or productive. I did not know what I was supposed to be doing, and could not prevent myself from climbing straight into bed upon returning home from the lab. Frustration with my idleness and procrastination in combination with feeling unsupported, and a long solitary winter, resulted in a downward spiral. My depression affected both my personal life and academics. I did not want to read, stared listlessly at my computer, was less precise, and found it difficult to start new experiments. Slugging through troubleshooting, messing up, or getting stuck made me want to curl up in a ball and retreat further from the world. I felt the insidious voice of impostors syndrome telling me that maybe I misled everyone to my actual abilities, and maybe this is not something I can do. I could not get thoughts that I had made a mistake in my choice of program or that I was not good enough to be a scientist out of my head. In the spring semester I started to crack. The condition of my cuticles, the most tangible expression of my emotional state, was appalling. I fell to pieces, in front of people. But feeling that helpless also finally forced me to reach out to other grad students and post docs in my department, as well as professors from undergrad and old friends from internships. They responded with understanding and advice. Since then I have actively worked on being more honest with my advisors and trying to communicate that I need more support. I have started to try and set small manageable tasks for myself rather than large goals. I prioritized myself and taking time to do art, read for pleasure and be with friends. This year has been hard. And now that I feel better it’s tempting to look back and want to kick myself for not taking advantage of every second, for not doing more or better. I have to remind myself to appreciate that although my first year in grad school has been very different from my expectations, I have gained a lot. I found a research topic I love, optimized a protocol and secured funding. My depression is wrong when it compares me to other people and tells me I have failed because I am not doing everything they are. My depression is wrong when it tells me I am not cut out for this because I did not accomplish every task on my to do list. Everything did not go perfectly, there is plenty of room for improvement, but I can learn from my mistakes without beating myself up about it. The start of the new semester is bringing along with it familiar frustrations and feelings of inadequacy. But if I have learned anything from this past year I hope it will be to try and relax, communicate when I am struggling, and try to enjoy the small things I love about science.